Deufol’s mission is to solve your most pressing packaging and distribution challenges through joint continuous improvement efforts and unique solutions. We will meet or exceed our customers’ expectations through the joint continuous improvement efforts of our Leadership, Quality Assurance, Design, Logistics, Manufacturing, and Customer Service groups. We provide innovative flexible packaging solutions to our customers in a cGMP compliant environment. The success of our mission will be evidenced by attaining and sustaining compliance with our customers’ expectations resulting in stronger business relationships with increased value for both organizations. Deufol has complete dedication to delivering on time quality products, in a safe environment, at the best economic value to our clients. We employ capable people who are committed to the mission and are empowered, trained, and rewarded for work that serves this mission. Processes are put in place to ensure that our performance is measured, reviewed, and acted upon in a cadence of our work every day. At the Deufol Group, we believe in mutual respect. We value the input of each and every employee in the shared effort to provide high-quality services to our customers. We believe in clear communication and bring on board as partners the people who can help us find solutions to problems. At Deufol, we believe in teamwork. In order to succeed as a team, we listen to each other and give our colleagues and managers honest feedback. This is how we continually develop and improve – which ultimately benefits our customers. We all accept responsibility for Deufol and its success. We value people who are willing to share responsibility and take the business forward together. Our promise is simple: we offer unique solutions powered by unequaled project management, data accuracy, quality and production speed at competitive prices. This enables our clients to focus on innovation and being market leaders. We offer a mix of solutions through a simple three-letter process: TPS. TPS stands for Tough Packs Solved. It’s our promise is to help you solve your most pressing packaging and distribution challenges. TPS isn’t just about packaging, though. It’s about understanding who you are, how your business operates, and how we can create solutions to overcome your biggest challenges (packaging or otherwise). TPS is a unique packaging methodology because it’s based in the unique goals and needs of your business. We don’t offer a standard, cookie-cutter solution because there’s no such thing as standard, cookie-cutter challenges. Your needs are unique, just like your business. No matter your challenge, we’re here to serve as your partner, all the way from product conception to production and packaging to warehousing and distribution. That’s the philosophy behind Tough Packs Solved and the promise you get when you work with Deufol. Ready to transform your packaging and distribution processes? Let’s talk about it. Contact us today to start the conversation with one of our packaging consultants. 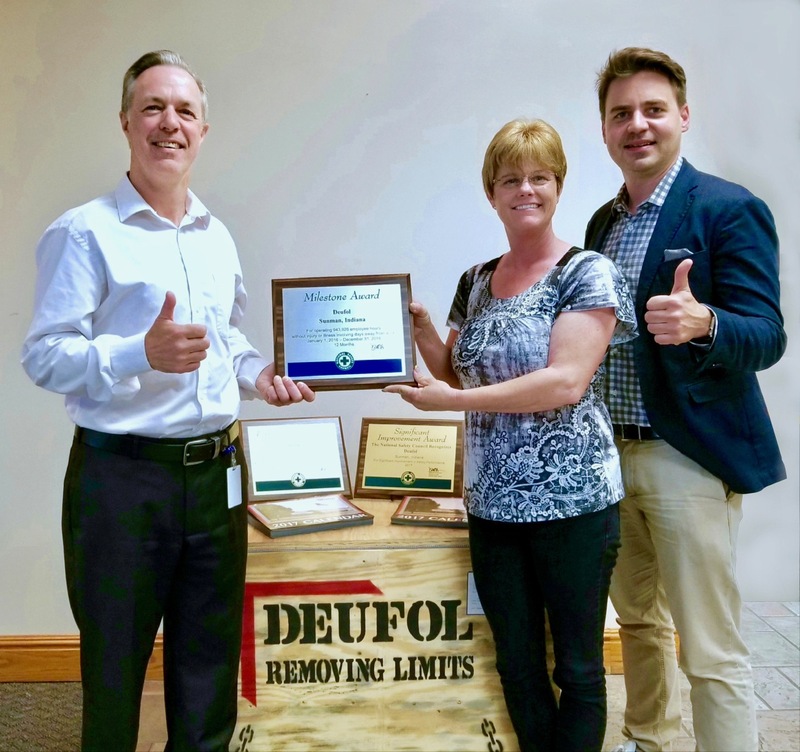 Deufol North America, the Sunman, Indiana-based global packaging, logistics, and supply chain firm, recently received four prestigious Occupational Awards from the National Safety Council, which promotes and advocates for enhanced safety protections in the workplace.